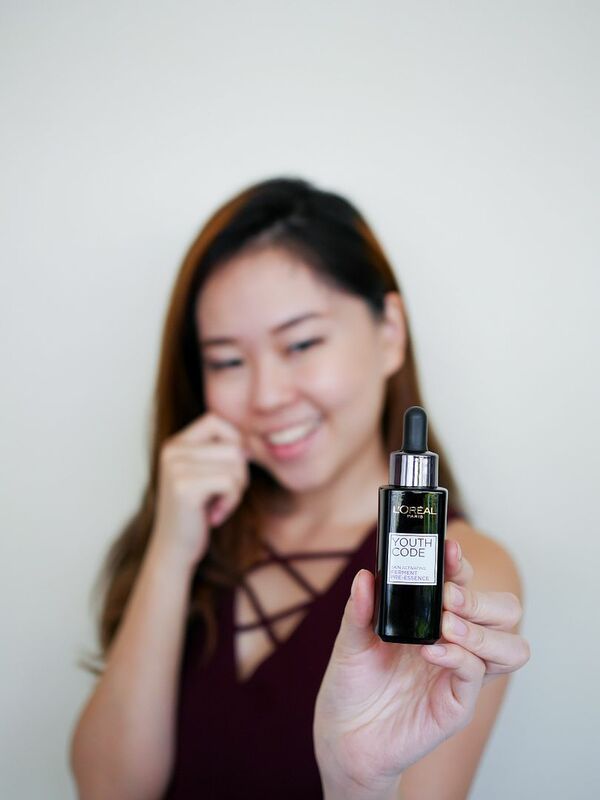 As I am about to hit my quarter life, I find myself facing a lot more worries and challenges, including taking care of my skin. I'll be honest with you, one of my biggest worries is losing a youthful look through several alerts such as sagging skin, formation of wrinkles and so on. I mean, who doesn't want to keep their youthful skin and prolong smooth wrinkle-free face canvas? 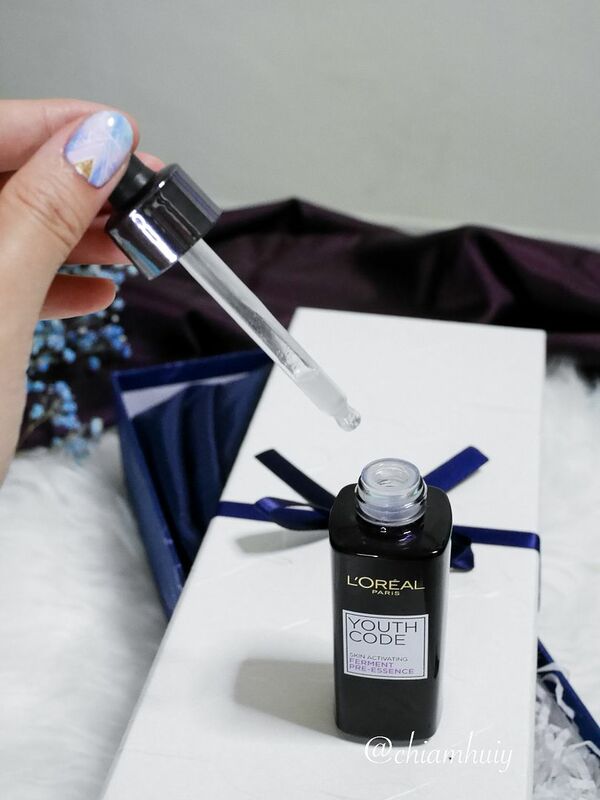 It's my first time trying out the L'Oreal Youth Code, which has now rebranded to L'Oreal Youth Code Ferment Pre-Essence, due to the additional of key ingredient Ferment Essence. 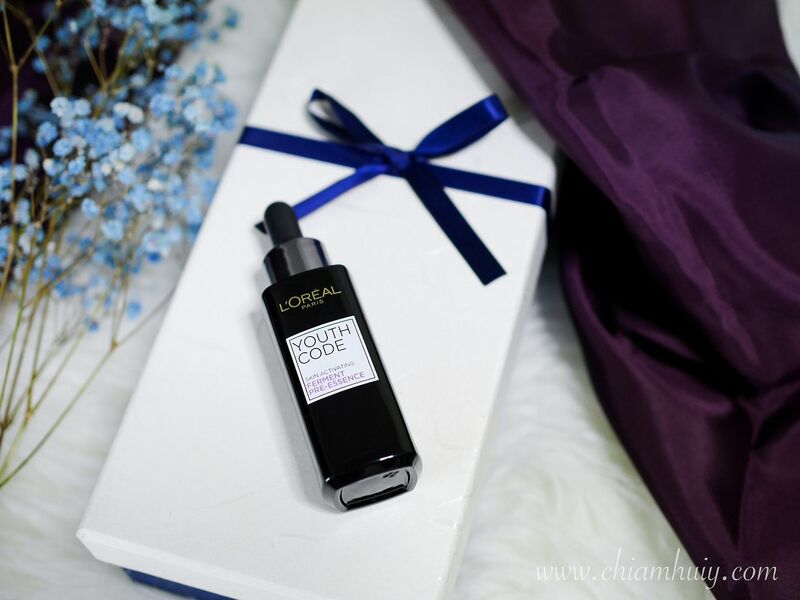 What is Ferment Essence? How does it help with our skin? 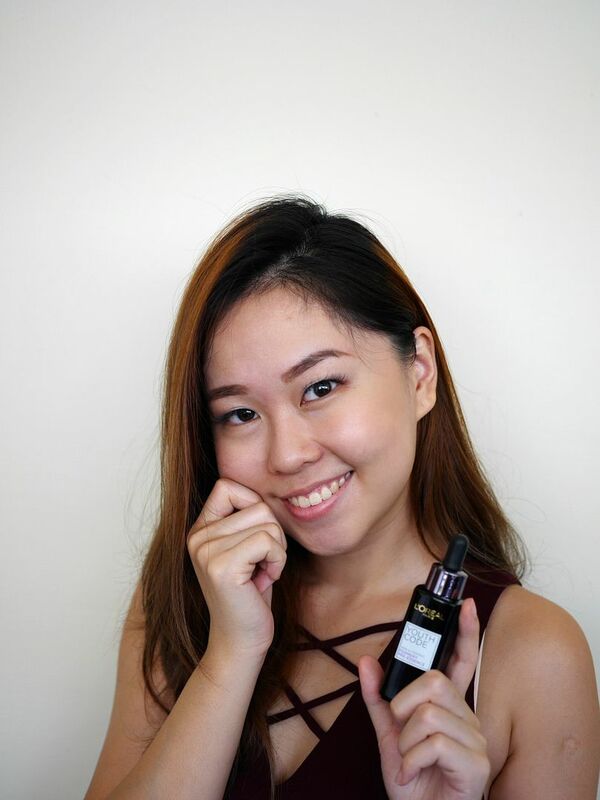 You might have heard of L'Oreal Youth Code, or you might have heard of the iconic celebrity ambassador of L'Oreal Youth Code, Rui En. 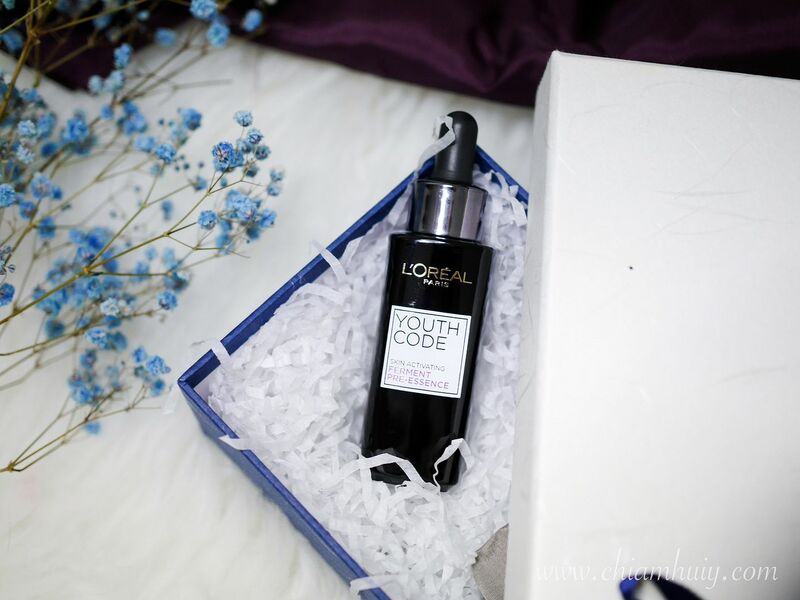 Each year since its first launch in 2012, L'Oreal Youth Code went through many changes to its packaging, but never once the formulation. This year, it's going through a breakthrough with the addition of a new ingredient, Ferment Essence. The bottle is quite portable considering the size of it. As we all know (and fear, obviously), our body metabolism rate decreases as we age. This is no different for our skin metabolism. 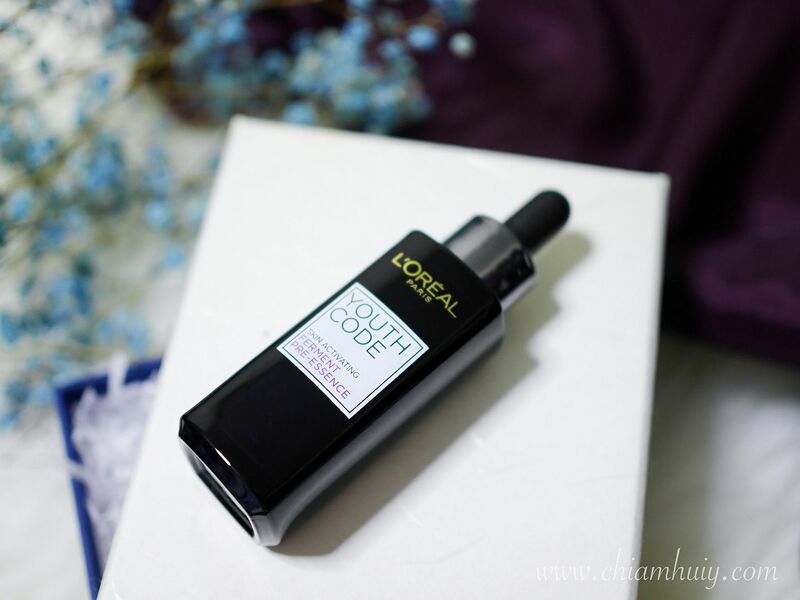 With the slowing of our skin metabolism, cell renewal properties slow down as well, hence the start of aging skin. It's an inevitable process, but at least we can do something to slow down this aging process! To apply, use the dropper to dispense a few drops on your palm. 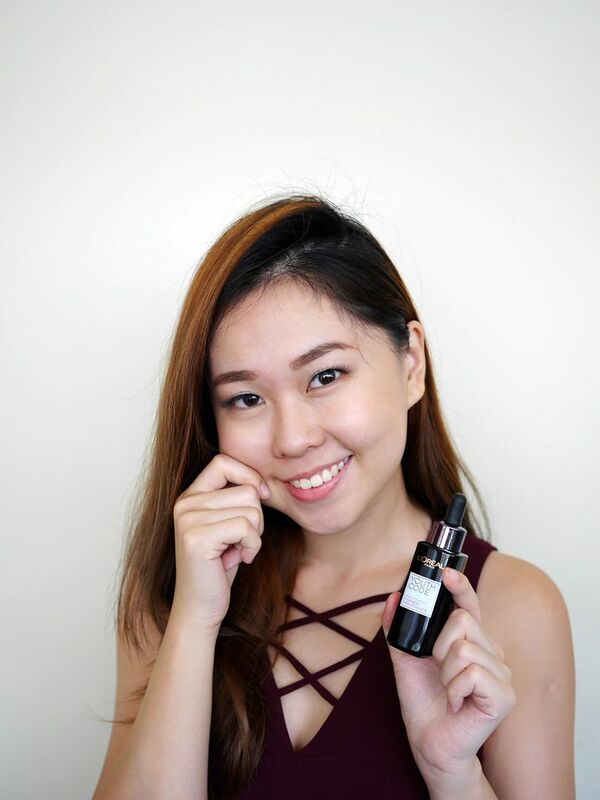 For myself, I take about 5-7 drops of the Pre-Essence and apply onto my whole face, ending off with patting motion. It helps my skin to better absorb the Ferment Pre-Essence. 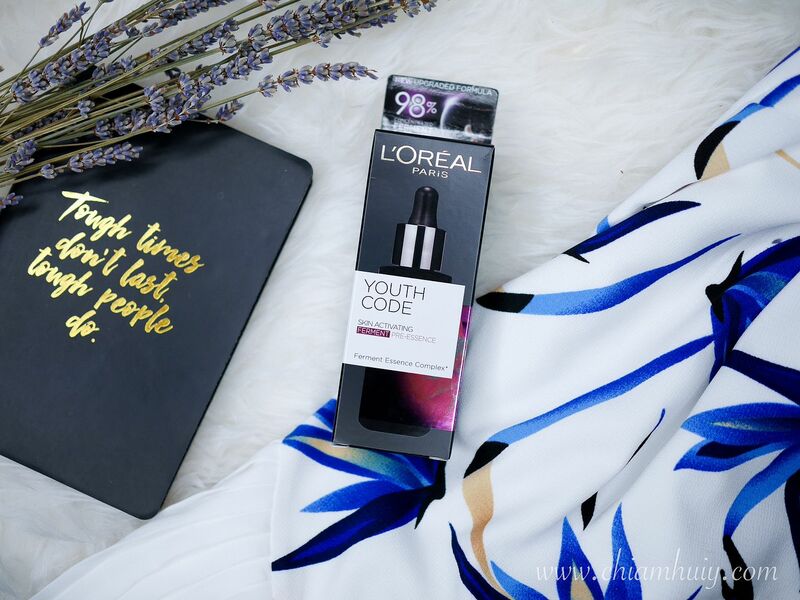 L'Oreal Youth Code Ferment Pre-Essence is extremely lightweight and odourless. As you can tell from the photo below, it flows down my hand really easily just like water. When spread, it gives a nice protective coverage without being too tacky. Skin feels moisturised just right. Not too sticky! I'm not sure about you, but when I think of anything relating to ferment, I would first expect it to have a rather unpleasant smell. I mean... I can't help it. Anything that has to do fermentation naturally links to foul smell, and I am surely not a fan of that. 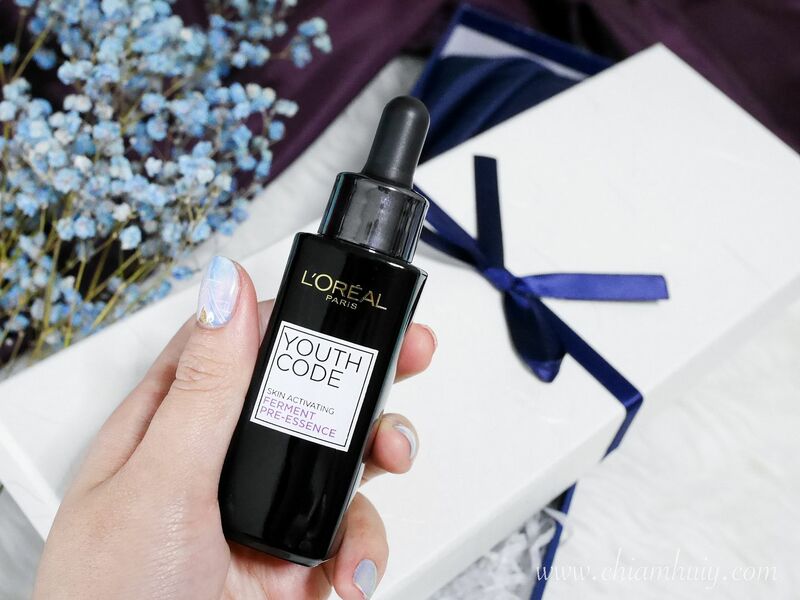 But THANKFULLY, L'Oreal Youth Code Ferment Pre-Essence is nowhere near my impression of ferment essence. In fact, the product has a subtle sweet scent which isn't too overwhelming. 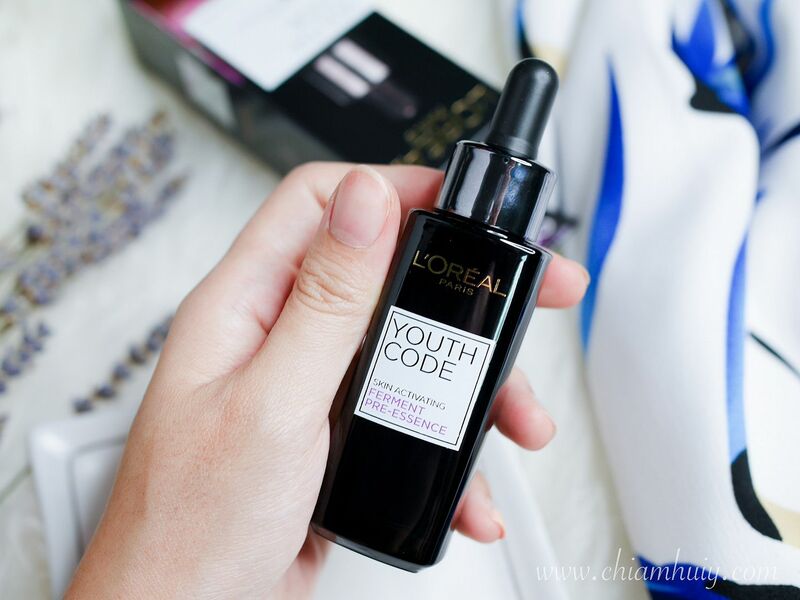 I've been using L'Oreal Youth Code Ferment Pre-Essence for about a week. 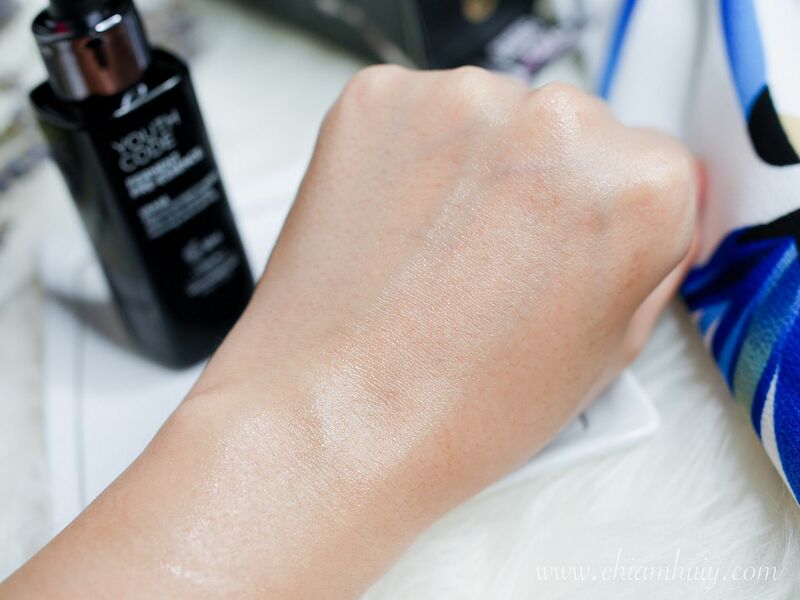 I use it right after my toner and before moisturiser. I do feel that skin is more protected and moisturised without feeling the tightness around my laugh lines and nose area like how I usually would. 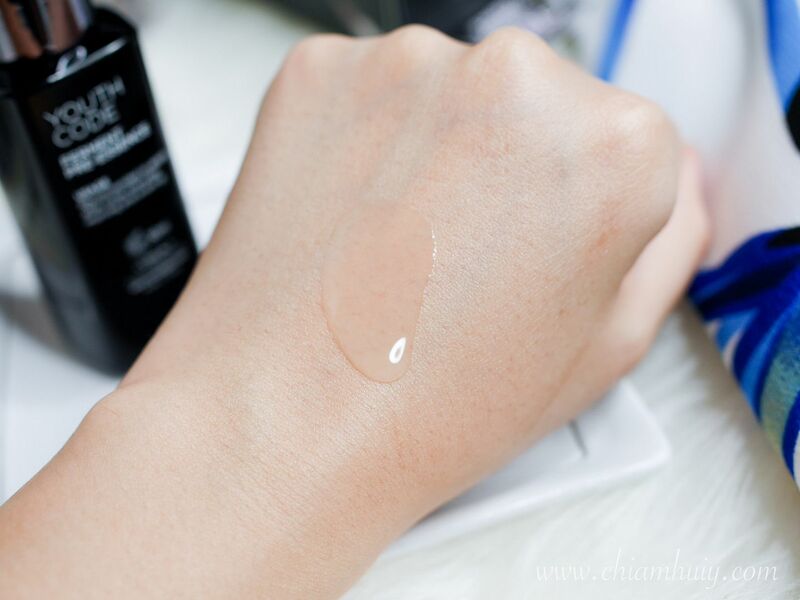 I'm surprised by how fast the Pre-Essence gets absorbed into my skin. It leaves a very smooth texture after absorption and only feels tacky if you intentionally press your fingers into your skin. Otherwise, skin surface feels baby-soft! For a longer term and more obvious results, I would say it takes time and dedication. I'll continue using this Ferment Pre-Essence and see how it goes! 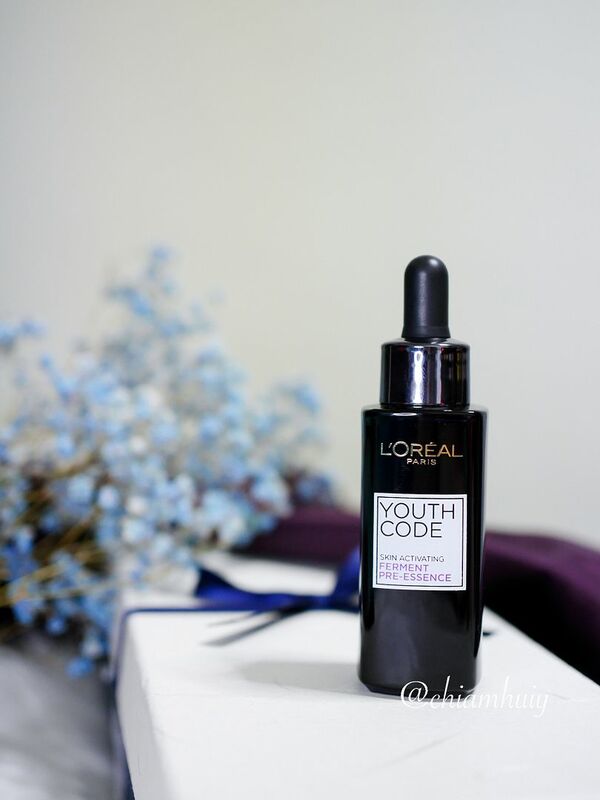 L'Oreal Youth Code Ferment Pre-Essence is retailing at $41.90 and is available at all leading stores such as Watsons, Guardian, Unity stores and major super/ hyper markets. For more, visit Loreal Paris website.